Photographers have been documenting wars since the invention of the camera. The dichotomy of heroism and suffering on the battlefield are a neverending source of material. The Great War in particular presented a compelling canvas for the rapidly developing art and science of combat photography. This new volume from Britain’s Imperial War Museum is a magnificent collection of photos from all theaters of the “war to end all wars,” meticulously culled from the museum’s extensive archive by the authors. The first thing a reader notices is the hefty construction of the book itself. This is truly a beautiful coffee table book, well constructed and practically asking to be opened and leafed through in a slow and thoughtful manner. 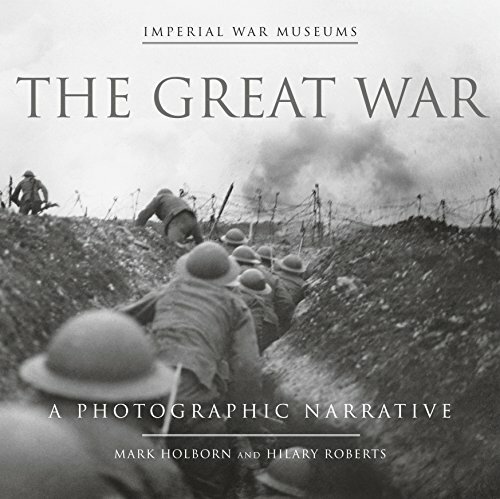 The photographs are chosen from a variety of settings and cover the entire span of the war from the heady days of 1914 when millions of Europeans headed off to a glorious and decisive war that would be over by Christmas to the very end in 1918–1919, when exhausted and much more sober soldiers and civilians expressed joy at what would become a very shortlived peace. With this first world war where British and Imperial forces fought all over Europe, Africa, the Middle East, and the oceans the authors had no shortage of subjects to choose from and did an excellent job in selecting a variety of situations and subjects. In addition to the expected shots of the carnage and destruction wrought by four years of trench warfare on the Western Front, there were many photos showing the more mundane aspects of a soldier’s life, including some very poignant pictures of troops’ efforts to add a homey touch to the bunkers and dugouts where many of them served for months or years. In addition to the incredible diversity of photos, the authors also provide an excellent narration on the state of photography at the time and provide some interesting history of the innovations in film and camera technology that happened both prior and during the war, rapidly advancing the craft and popularity of photojournalism during wartime. As part of this lesson on photography and its effects on the mass media of the day, the authors describe not only the technological advancement in cameras and film technology, but also the changes in the publishing industry. In particular, the halftone printing technique combined text and photos on a printed page enabling the explosion of illustrated magazines in the years before World War I and directly to a plethora of volumes chronicling the events of the war almost in real time. The authors tie both the historical and journalistic aspects together in a wonderful timeline at the beginning of each chapter, outlining mass media, photography, and world events. This tabular comparison shows not only how photography matured as both and art and science during the war, but also the new challenges faced by governments confronting the power of photographs for propaganda. There was very little not to like about The Great War: A Photographic Narrative—especially for students of World War I or combat photography. Although a little pricey, it provides many never before seen pictures from a bygone era. The efforts by the authors to provide pictures from every theater British troops served really do chronicle the truly worldwide span of the war. By combining marvelous photography with a masterful blend of technical and military history, the authors have created a book that conflates the emotional reactions elicited by the imagery with the thoughtfulness of well-written history.